The campus was conspicuously empty as the Spring Semester drew to a close, but for members of UCMP, the work was just beginning. As UC Berkeley undergraduates packed up their things and headed off for their summer vacations, UCMP researchers took off for the field. This past season was a productive one for UCMP personnel as they brought their research and teaching activities outdoors. Whether they led projects or joined in on established ones, the UCMPers had their share of discovery, adventure, and fun. Some traveled as far as Guam and Indonesia while others stayed a little closer to Berkeley. Regardless of mileage accrued or the length of time away from campus, they all returned with renewed vigor and enthusiastic reports of their adventures. Dr. Tony Barnosky led UC Berkeley and Stanford students across the western United States in a directed field course offered jointly with Dr. Liz Hadly (Stanford University). The class, which was comprised of twelve graduate students, undergraduates, and post-docs, traced the ancient movement of the Yellowstone Hot Spot and its effects on shaping the biota. The hot spot is an underground magma plume that formed an ancestral Yellowstone Park in southeastern Oregon about 16 million years ago, then moved across Idaho to its present locality in Yellowstone National Park in Wyoming. The movement is actually caused by the shifting of the continental plates over the stationary plume. The hot spot pushes up the plates as they pass over it, creating the volcanoes, geysers and hot springs that characterize Yellowstone. Dr. Allen Collins and Teacher Associate Jennifer Johnson spent time this summer at the University of Guams Marine Laboratory. Their work centered on two projects relating to Allens research on marine invertebrates. First, Allen and Jen made casts of trails left by various species of worms in order to investigate the trace-making capabilities of modern animals with various types of body architectures. Drs. 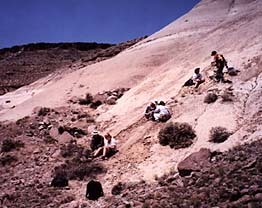 Jim Valentine, Jere Lipps and Allen are relating these observations to what they have seen in the early fossil record of tracks and trails. By determining what kinds of traces can be created by the modern animals, they will make and test hypotheses about the nature of the animals that created the fossilized tracks.